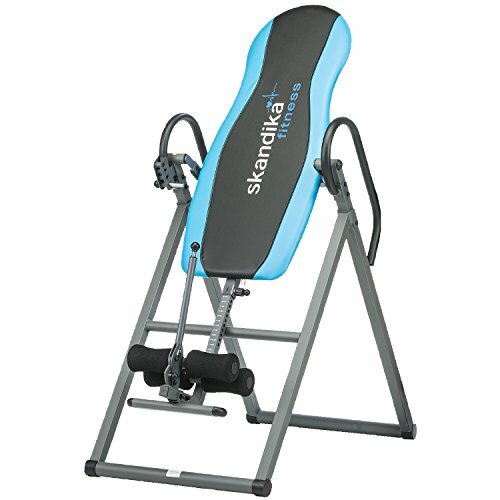 If you have arrived at this page from the homepage you should already have a good idea of why the Skandika inversion table is one of the best inversion tables to buy. The main highlights of this Skandika inversion table are certainly the features, that combine to make a very good all round package. This inversion table is an ideal choice for anyone who is new to the world of inversion. 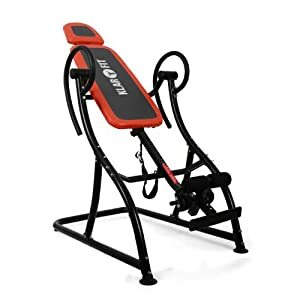 It is an equally good choice for those familiar with inversion who perhaps find Teeter inversion tables a little overpriced. 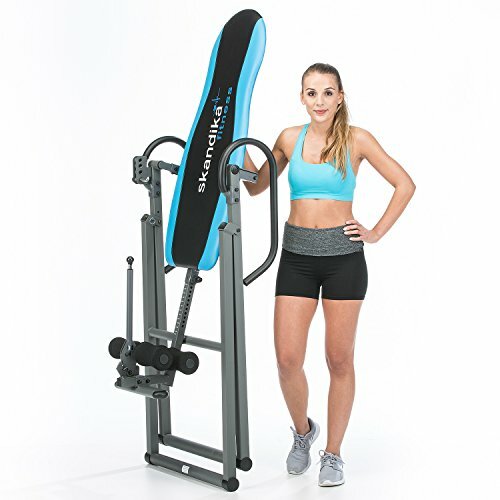 This is a great feature especially for those wishing to build confidence when using an inversion table. The inversion limitation function is a pin operated adjustment that limits the maximum inversion angle. 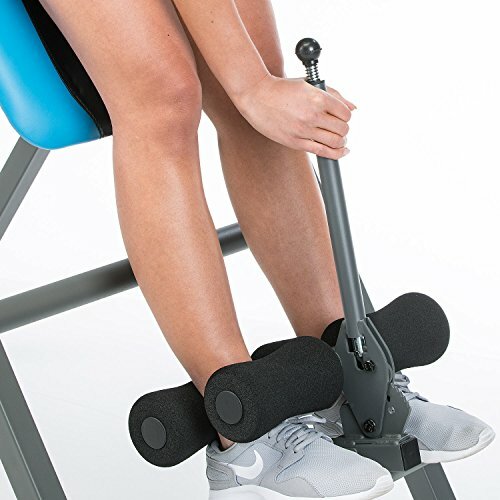 Situated on the side of the inversion table, the pin limiting system allows the user to control the maximum angle at which the inversion table inverts. You have a choice of either 0° (horizontal), 20 °, 40 ° or 60 ° inversion. Once you are more confident using the table you can remove the pin which allows for full 90 degree or free inversion. The inversion limitation function is (in my opinion) far superior to the often found tether strap system on other inversion tables. A feature where you have to adjust a strap below the inversion table before starting inversion to limit the inverted angle. Not only does the pin limitation device look more tidy than the tether strap system, it is also less hassle to use and adjust. The long ankle lever is another excellent feature and few inversions tables available in the UK feature both the ankle lever and the pin inversion limitation device mentioned above. The extra long ankle lever may not be overly useful to everyone. However, it does reduce the risk of injuring your back since you do not have to reach down as far to secure your ankles. While many able bodied folk probably have no worries about having to bend over to secure ankles, those who are less flexible should find the lever a nice addition. Some other minor features to mention are the foam padded ankle brackets. While most inversion tables feature a front foam pad, some do not have one for the back of the legs. Often other inversion tables feature moulded plastic for the back of the legs which some may find uncomfortable. 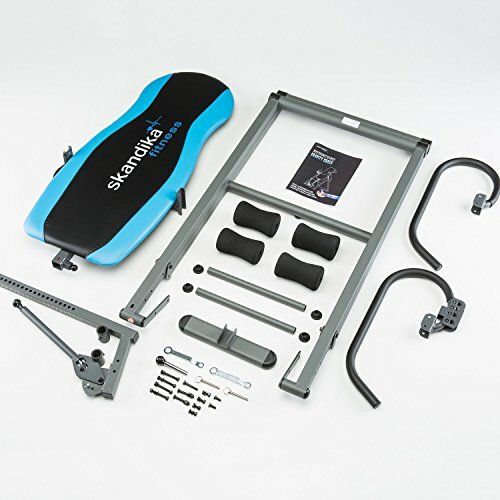 The Skandika inversion table features foam padded roller brackets on both the front and back (as you can see in the picture above). The padded backrest is also a nice design feature to further add to the comfort of the inversion table. 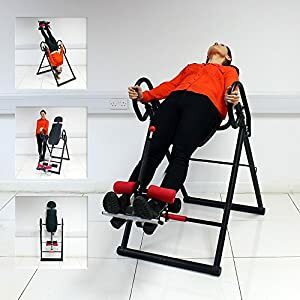 As you will see if you take a look in the next tab at all of the buyer reviews, there is almost no negativity surrounding this inversion table. The extra features and good looks really make this inversion table stand out from the vast majority in the UK marketplace. Another small bonus with this inversion table is it is fairly easy to assemble. 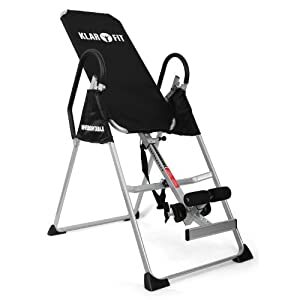 In summary if a Teeter inversion table is a little too expensive or perhaps you are looking for a cheaper table to “test out the water”, this Skandika inversion table is an ideal choice. In my opinion this is currently the (joint) second best inversion table to consider if you live in the UK. The other (joint) second inversion table you may also like to take a look at is the SportPlus inversion table here. While the SportPlus inversion table is a little cheaper, it does not feature the extra long ankle lever.